Statement earrings have been an ongoing trend since A/W and I definitely mentioned it in my “The Must Have Accessories Every Fashion Girl Is Wearing” post that was published last year. Specifically, tasseled earrings have been all over social. In particular, I’m on the hunt for a 3-layer tassel earrings. I’d love it if each layer was a different shade of like blue or pink or any colour really. It’d really make a statement to any outfit! I’ve been on the hunt for a small straw bag for over a year now! It’s been so difficult for me to find one but I recently found my dream straw bag from Kembali Collective; it’s in the shape of a hexagon so I am ALL over it. Straw/woven bags are the must to have when going on vacation. I feel like it just screams travel and you don’t need to worry so much about it versus if you were bringing a leather crossbody to the beach if you know what I’m saying. Neck scarves have been a favourite accessory of mine since high school! I mentioned in my “Stay Warm, Get Neck-ed | Styling Neckerchiefs” post last year how someone in high school pointed out that I look like a flight attendant when it’s tied that way. Let me just say, I’ve really improved in the ways I style my silk scarves since then and even within the last year since that post! They’re the perfect accessory to add to your handbag and your hair as well. I love the versatility of square silk scarves because there’s so many possibilities when it comes to styling. 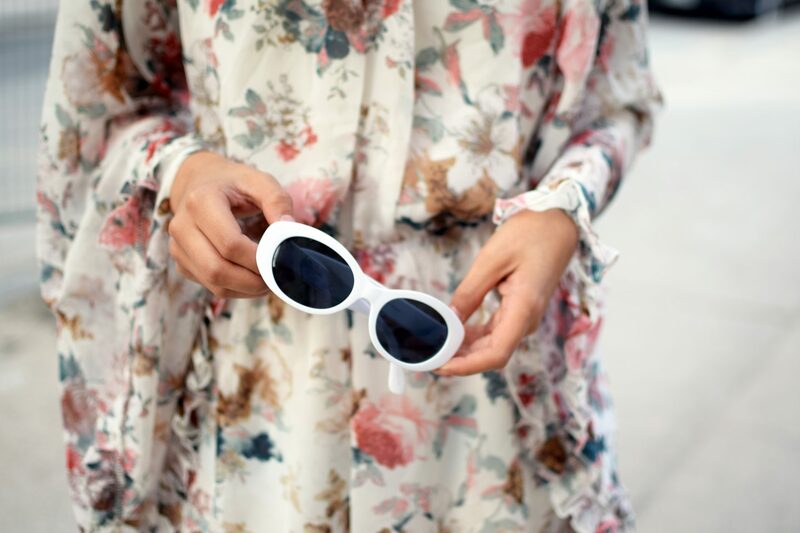 There are the classic sunnies that will never go out of style because well, they’re classics but recently vintage sunglasses have been coming back and better than ever. There are a few shapes that are the stars when it comes to sunglasses and they’re not your average, run of the mill, round Ray-Bans or trendy Quay sunglasses. Oversized was the trend for a while but now super small sunglasses that are from the 90s. Not only that, but clout glasses are very 60s and have been seen on so many influencers. The last trend is one that you’ve probably heard of which are cat-eye sunglasses but I’m talking about the very pointy cat-eye. This is definitely an on-going trend but it’s been seen more this year than in the recent years! Remember the days where you wouldn’t be caught dead in a fanny pack? Well, fanny packs got a huge upgrade by becoming stylish. There’s a variety when it comes to shapes and the type of material. Personally, I love the structured belt bags versus the typical fanny pack look because it is more of a polished look in my opinion. The concept of fanny packs is great though; it’s basically like a cross body bag. I love the idea of being able to carry your important stuff but not need to worry about having a bag attached to your hand or arm the whole time. As for the pieces I’m wearing, I obviously have to mention them because they’re insanely adorable. The gorgeous open back romper is from SheIn. As you know, I continuously work with SheIn so this was my next pick. I’m extremely happy with how it looks and the detailing on it is so summery and I’ll definitely be using that more. With the open back on the romper, I didn’t want to do much accessorizing with a belt, so instead I decided to be dramatic with the earrings. The earrings are one of my new favourites and those are from ASOS. 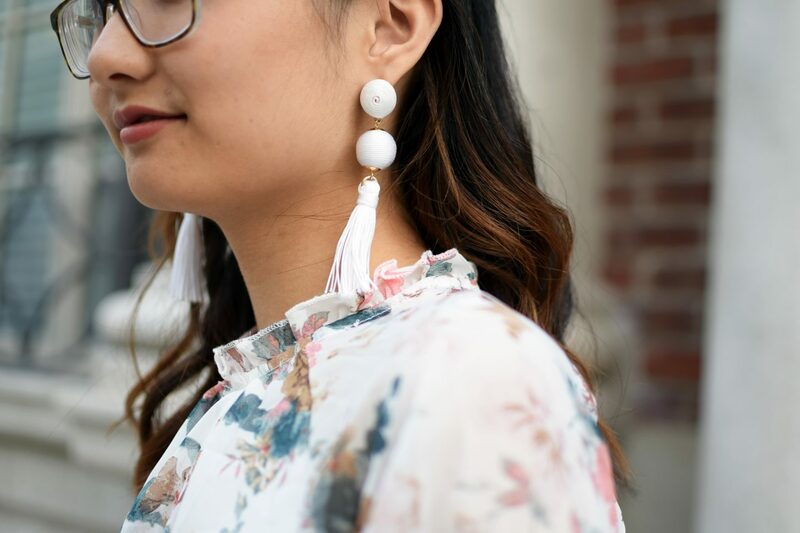 I’ve been finding so many great tassel earrings so I was glad to snag this pair because I haven’t seen any like it in store yet. What accessories are you planning on wearing this spring/summer? Let me know in the comments what your favourite accessories are!